Assigned to a field hospital in France, Lily is reunited with Robert Fraser, her dear brother Edward’s best friend. The handsome Scottish surgeon has always encouraged Lily’s dreams. She doesn’t care that Robbie grew up in poverty—she yearns for their friendly affection to become something more. Lily is the most beautiful—and forbidden—woman Robbie has ever known. Fearful for her life, he’s determined to keep her safe, even if it means breaking her heart. In a world divided by class, filled with uncertainty and death, can their hope for love survive. . . or will it become another casualty of this tragic war? Lily is done being controlled by her domineering mother who only considers the family's place in society rather than a person's happiness. When her family crosses one too many lines, she leaves her home to pursue a life of her own choosing. She dreams of helping with the war effort. While she works to find her place, she finds herself sharing her hopes and dreams in letters to Robbie, her brother's best friend and her secret crush. The war goes on longer than anyone expects and she finally gets and opportunity to work as an ambulance driver. Robbie attempts to keep her safe. They both wonder if they can make it to the end of the war with all their dreams in tact. This was a nice romance with World War I as the backdrop. Sometimes we get so caught up with heroines that jump though hoops of fire and all the crazy adventure that come with them that it can be difficult to transition to a normal character with quiet courage and tremendous character growth. Lily knows nothing about the world and has no real skills. She learns how to drive which sets her apart from the women of this time period but other than that, she has to learn to be on her own. It took me a little while to really appreciate her as a character but I came around. She's realistic and focused. It was quite refreshing. The descriptions of a triage hospital in the middle of a war were well done and set this one apart because of those details. While Robbie and Lily's romance was front and center, I liked them together but wasn't invested in their romance as much as I wanted to be. It wasn't earth shattering but it was nice. 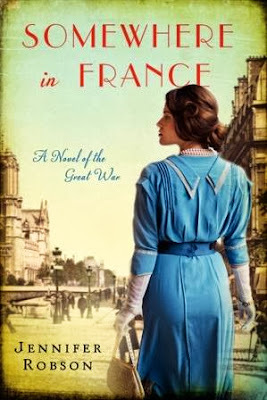 Overall, this is well-written romance set during the Great War. I'm actually drawn to this book. I'm okay with the romance not being over the top, I use to read a lot of Victoria Holt and her use of romance is pretty... subtle. :) I might have to check this one out! I'm not a huge romance fan, but I don't mind when the romance plays a smaller role like it seems to do in this title. I also LOVE that cover! Thanks for the review! "Lily knows nothing about the world and has no real skills" To me Lily sounds like quite a lot of "regular" people and I think I could appreciate her for that.